Back in November, we crowned BMW's radical i3 the best electric car in Blighty – or anywhere else in the world, for that matter. Just a few months later, that title is already under threat and from a surprising new entrant into the EV market. It's the new Volkswagen e-up! Not surprising in the sense that it exists. We've known the Volkswagen e-up! Was coming for some time. But surprising in the sense that it turns out to be such a compelling proposition. That's because the e-up! is unashamedly an electric rehash of a conventional combustion car. Much of the BMW i3's appeal is based on its ground-up, clean-sheet, pure-electric engineering. The i3, then, is the electric car you'd design if free from all combustion-related baggage. The e-up! is inherently more compromised. At this stage we also need to throw the Renault Zoe into the mix. It falls somewhere in between the i3 and e-up! in terms of the purity of its engineering. Renault pitches it as an EV through and through. And it does have unique sheet metal. It isn't just a Renault Clio with a big battery. But it is still derived from Renault's combustion car architecture. It's also worth noting that the £15,195 Renault is much more of a direct competitor to the £19,250 Volkswagen e-up! in terms of pricing, where the £25,680 BMW i3 operates in a pricier part of the market, especially when you start comparing lease deals. That the e-up! remains more expensive than the Zoe is partly down to differences in things like battery leasing, but we'll come to that in a moment. Get underneath the new Volkswagen e-up! and you begin to understand why this is no low-cost lash up. Our test drive started from VW's technical training centre in Milton Keynes. It's here that VW's main agent technicians learn about the nuances of looking after electric cars. Handily, that means an e-up! or two up on a ramp and a good view of the bottom of the car. From there you can see how the battery is essentially a thin slice forming the bottom of the chassis. Not a lump chucked in the boot eating up luggage space and knackering the weight distribution, then. Even if you'd engineered the car from the very beginning for electric power, the battery packaging wouldn't be any different. Whether you'd put the electric motor and single-speed reduction drive up front or in the rear is an interesting question. BMW went for rear installation and thus rear drive. But there are decent reasons in terms of packaging and driving dynamics (specifically safety) to stick it all up front. Anyway, the point is that it turns out the Volkswagen e-up! is probably as well engineered for batteries as any other EV. This is no lash up. 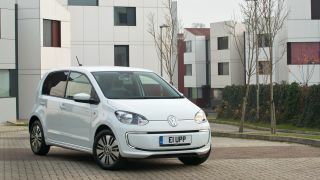 Elsewhere, the car comes across as being pretty much identical to any other Volkswagen e-up! It's a slick, pretty well appointed city car with an appealing cabin and more space inside than you'd merit from the teensy exterior. Oh, and finally, the e-up! is only available in five-door trim. Let's start with the obvious bit. The Volkswagen e-up! gets a sodding great 230kg lithium battery pack. Actually, it's not that huge by EV standards. Batteries for these cars are big. So it's an 18.7kWh battery where both the Renault Zoe and BMW i3 sport 22kWh packs. As for the motor, it's an 82hp item, which makes the e-up! the most powerful up! you can buy, albeit the heaviest, too. Using a standard UK socket, a full charge from empty is nine hours, but VW can provide a fast-charge wall box that reduces that to six hours.